"The moral ethos of sport," writes New York Times op-ed columnist David Brooks today—and let's pause right there for a word of professional advice: if you use the word "sport," you should not be writing about sports, unless you are British and you also write "maths," in which case you may write about "sport" but we won't care because, good gravy, British sports. American writers who use "sport" to mean "sports" are trying to signal that they are discussing something more ineffable and profound than the actual sports played by actual people. In Brooks's case, this is true, because what that sentence goes on to say is that the moral ethos of sport "is in tension with the moral ethos of faith, whether Jewish, Christian or Muslim." All of this is Brooks's expansion on his central, eagerly news-pegged claim that Jeremy Lin is an "anomaly" because he is "a religious person in professional sports." Brooks concedes that there is a "Tim Tebow" out there, and that the public has even "become accustomed" to figures who combine religion and athletics. Don't worry, Kurt Warner, Dwight Howard, Josh Hamilton, Troy Polamalu, and Albert Pujols! He's not trying to make you feel unusual. He doesn't really mean "anomaly" when he writes "anomaly." He's just saying that there is a "problematic" relationship between two of America's most widespread and overlapping sets of cultural practices. 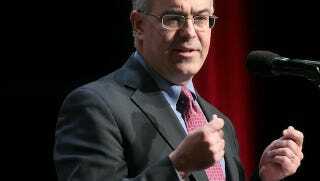 David Brooks's entire career has been one long, tragic bluff, in which a spectacularly effete nerd from the University of Chicago—ensconced in the Washington D.C. suburbs and the community of elite mainstream journalists—peddles himself as an oppositional figure to the college-educated liberal professional class, an expert on Real America. This upmarket Jeff Foxworthy shtick has led to endless pratfalls over facts that any Real American sixth-grader could keep straight. This sporting ethos pervades modern life and shapes how we think about business, academic and political competition. But there's no use denying—though many do deny it—that this ethos violates the religious ethos on many levels. The religious ethos is about redemption, self-abnegation and surrender to God. Yes, as the saying goes, there's no "I" in "religion." Oh, wait, that's not how the saying goes, is it? On reflection, Brooks's vision of American sport—"assertive, proud, intimidating," making a "straight shot" for the "admiration" of other people—is not a bad description of the loudest strain of American born-again evangelicalism. Whatever he's been doing instead of watching athletic contests, Brooks apparently hasn't been watching the Republican debates. Anyway, nevertheless—what were we talking about? Right, we were talking about Jeremy Lin.